Our Paris Tour The Marais takes you though one of the oldest neighborhoods in Paris. The re-construction of the city by Napoleon III and Baron Haussmann almost by-passed the Marais, leaving intact many impressive buildings from the 16th and 17th centuries. The Marais retains a "village feel" with narrow winding streets, boutiques and quiet residential areas. This is simply Old Paris. Our Paris Tour The Marais visits one of the oldest buildings in Paris, the Hotel de Sens, the 17th century village of St. Paul, now a center for art galleries and craft shops complete with connecting courtyards, the Hotel de Sully and the Place des Vosges, the oldest square in Paris. We will introduce you to the Musée Carnavalet, the municipal History of Paris museum housed in the exquisite Hôtel Carnavalet. 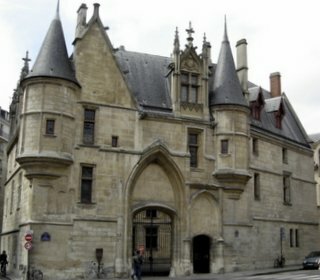 The Marais is famous for its massive buildings called "hotels", usually named for the nobility who lived in them. Among them is the home the architect of Les Invalides, the Hôtel Liberal Bruand, which he built for himself in 1685 and which now holds temporary modern art exhibits. The Hôtel Rohan and the Hôtel de Soubise now house the National Archives of France and the Musée de l'Histoire de France. Our Paris Tour The Marais is an extremely interesting walk with so much to see. Along the way are shops, exclusive boutiques, cafés and restaurants. This is an area of Paris that should not be missed. The fee for the tour is 95 euros for your party of up to 4 persons. This is not a per person fee but the total price of the tour. To make your reservation, use the form below. We will reply with a confirmation.